Day 1. Arrival in Tbilisi. Meet at the airport. Transfer to the hotel. Welcome dinner at a Georgian Restaurant. Day 2. We travel to Kakheti province and on the way explore David Gareji Monastery. The Monastery is situated in Gareji semi-desert, 75km southeast from Tbilisi. Walk up to Udabno Monastery to explore some of the fine frescos of the 8-13th c. and cave architecture. Continue driving to Telavi we will visit small local farm to have dinner tasting homemade food and wine made in accordance to the old Georgian traditions taken through centuries. This method of winemaking recently has joined the UNESCO heritage list. Overnight in Telavi at a private house. Day 3. After breakfast we depart in a 4WD for Tusheti Province. The mountain road is steep and rough. Along the way we pass wonderful scenery and dense pine forests. 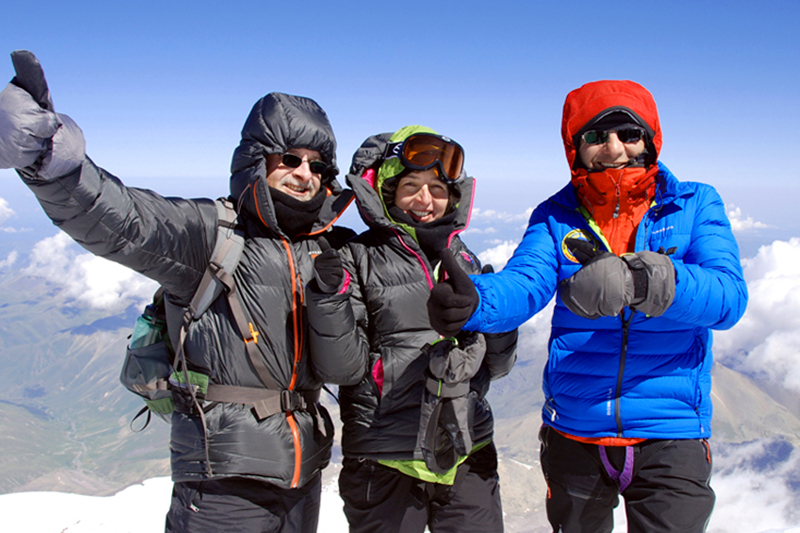 We cross the Main Caucasian Ridge over the Abano Pass (2930m) . 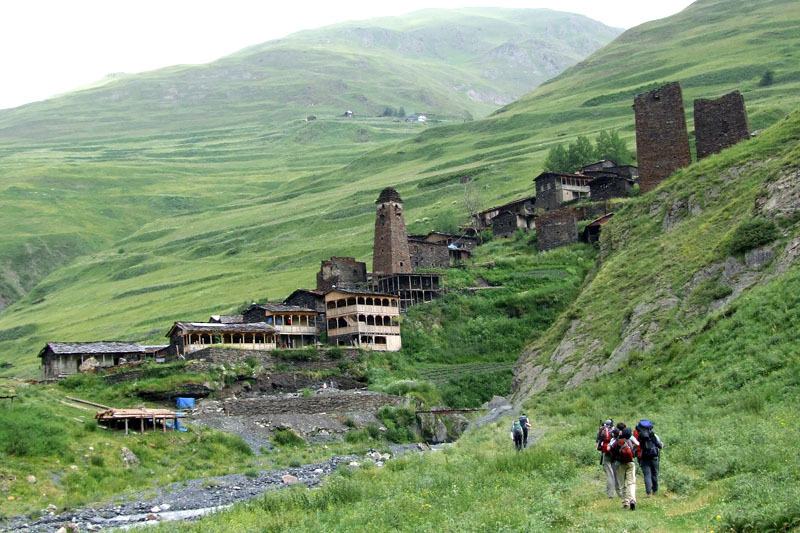 Continue down to the mountainous Tusheti and the town Omalo – the administrative centre of mountainous Tusheti. Most of our route in the Tusheti region will go in the territory of the Tusheti National Park, which is the largest protected area in Europe. Night at guesthouse at about 2030m. Day 4. Morning visit the medieval fortress Kesalo and allow time to learn about local people’s everyday life. Afternoon we leave Omalo. Walk down a steep path through forest to cross the river Pirikita Alazani over a wooden hanging bridge, then up a track out of the forest and on to the settlement of Shenako 2050m, 2-3 hrs walk. This is an excellent day to tone up our muscles for the days ahead. Shenako is on a gentle slope and is famous for its ancient architecture, an old farm-yard and Christian Church (13th -14thC) - one of the few in the highland regions of Georgia. Here we have dinner consisting mainly with local cuisine. Day 5. 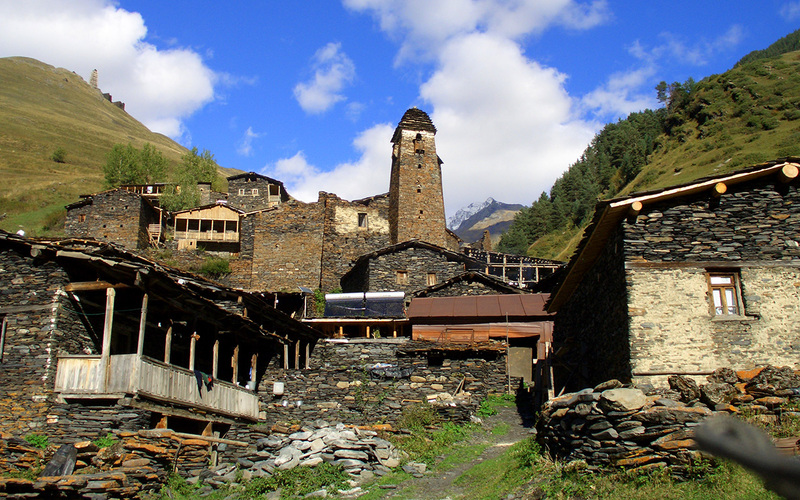 A fascinating trek over the pass at 2560m to the village Dartlo. We pass the villages of Diklo and Chego, which is located on a steep slope, and get down to the Pirikita Alazani Gorge. Two sides of the gorge have very different vegetation. The slopes on the right side of the gorge are grassy and on the left hand are covered by the rich pine tree forests. Reach medieval village of Dartlo 1850m; about 7–8 hours walk on this day. This is an amazing village with its medieval towers, creating a wonderful landscape. Overnight at a guesthouse in the village. Day 6. Walk to village Parsma (1960m), one of the fascinating and remote mountainous villages in Georgia. Walk in the area to visit the village. Continue walking to the village Girevi (2000m). Girevi is the last inhabited point in this part of the gorge with a few families living here. Camp near the village. About 5 hours walking. Day 7. Continuing up the Pirikita Alazani, the path becomes narrower. We have lunch near a shepherds hut before the gorge gets narrow and heading towards the Atsunta Pass up grassy slopes. Camp at 2400m, 7 hrs walk. There is a wonderful view of the mountains. Night in tents. Day 8. At first the route goes on a good path through alpine meadows along the river and then up grassy slopes with and scree sections at the end we walk to the Atsunta Pass (3530m). From the pass we have spectacular views of the surrounding mountains and deep canyons of Khevsureti province where we will walk the next few days. Descent to our campsite (at 2700m) following mostly scree slopes. About 8 hours walking.Night in tents. Day 9. 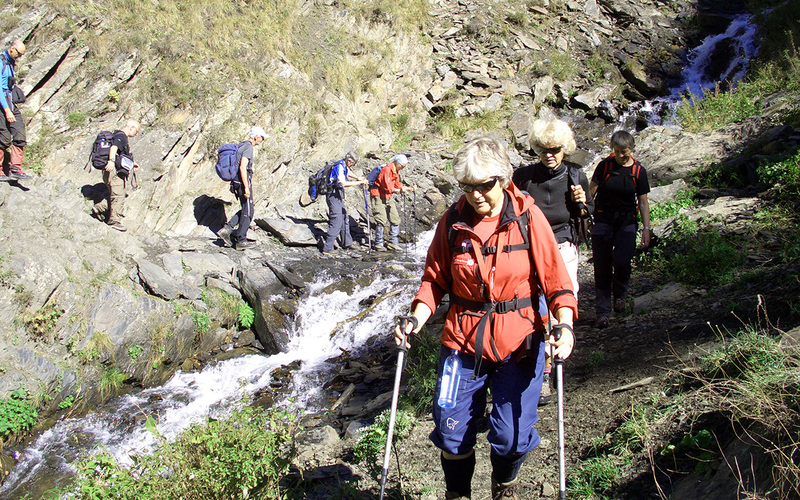 We walk about 4-5 hours down along a nerrow path to Khevsureti province. To the north we have amazing view of Mt.Tebulo (4500m). Passing the village Khonischala we reach Andaki river gorge and the village Mutso (1850m). Mutso is famous with its medieval fortress, located on a steep hill. Only a third part of the fortress has survived but it still leaves a great impression on visitors. At the village we meet our 4WD cars and drive last 11km to the village Shatili (1400m). 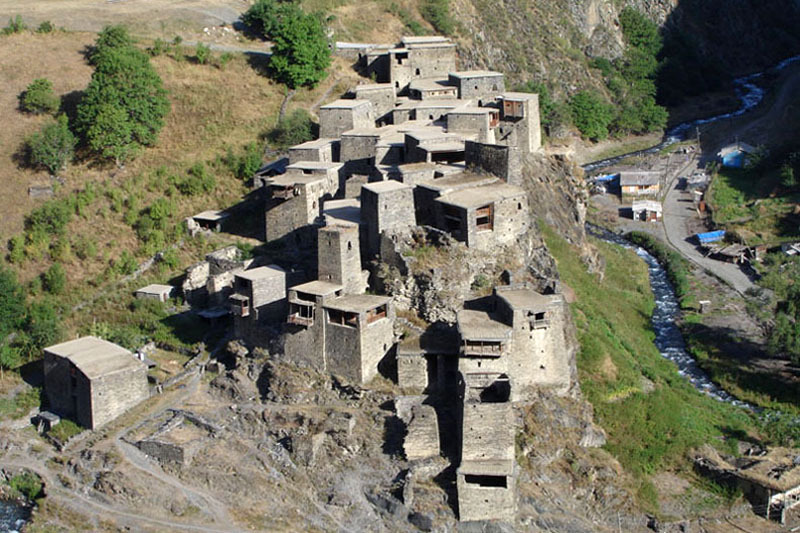 Shatili village-citadel, one of the highlights of Georgia, with its mighty towers stands proudly in Arguni river valley since the 9th - 11th centuries. Untouched by the outside world, people living in this stunning environment have preserved their ancient cultures and traditions. Here we are privileged to witness their way of life. We accommodate at a village house. leading us south to Mtskheta, the ancient capital of Georgia. Mtskheta was the capital of Georgian Kingdom of Iberia during 500BC - 500AD. Here Georgians accepted Christianity in the beginning of 4th century.The town and its architectural monuments are included in the World's Cultural Heritage of UNESCO. Visit Mtskheta and drive to Tbilisi. Hotel. Day 11. Free day in Tbilisi. This is free day to explore old town, probably visit souvenir shops, flea market. According to the group wish it is also possible to organise sightseeing tour to Uplistsikhe cave town (inhabited from the 6th century BC to the 1400s). Or day trip to the town Kazbegi enjoy mountainous scenery along the Georgian Military Highway and beautiful view of Mt Kazbek. 5047m. Farewell dinner at a restaurant in Tbilisi. Day 12. Transfer to the airport for the return flight home.